A small wild cat of Asiatic origin, Leopard Cat is one of the most beautiful felines in nature. It has a wide geographical distribution with marked differences in appearance in various parts of its range, leading many to classify it into a variety of subspecies. Size also varies in accordance with the habitat. In the southern part of its range, the Leopard Cat is nearly two feet long (including tail) whereas the northern Leopard Cat of Amur region is longer (over three feet) and heavier (ten to fifteen pounds). Prionailurus Bengalensis, the Leopard Cat is slightly larger than a big domestic cat. Fur color also varies across the range of Leopard Cat, though it is generally yellowish in south and grayish-white in north. Underside, chest, lower part of head are all white with various dark markings, spots and rosettes, on the body. These brownish black spots often join to form stripes on the back and head. The tail has black rings towards its tip. Residents of forests and grasslands, Leopard Cats are seldom seen in dry areas. Preferring watery areas they avoid arid habitats and may reside in wooded areas and scrubs. They are excellent climbers and capable swimmers. These attributes, along with their wide distribution in the wild and adaptability render them able to take down a variety of animals including hares, birds, fish, rodents, insects and even bats. Chiefly nocturnal hunters, they have also been reported to be active in day time. Primarily solitary, Leopard Cats are seen together in mating seasons. After a gestational period nearing two and a half months a litter of two to four kittens is born. Mother rears them up and may place them in burrows and bush before they gain maturity and independence. There is need for greater study of these beautiful cats in the wild. 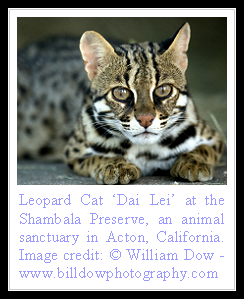 Leopard Cats have a vast range in Southeast Asia and their conservation status varies across it. It is believed though that they are vulnerable in certain islands. 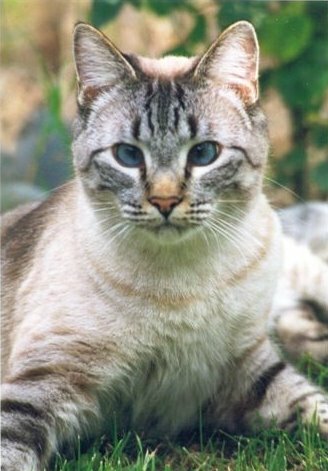 The cat is resistant to changes in its environment so the chief threat is not habitat destruction but hunting for commercial purposes! The Leopard Cat is very beautiful. And he sure has big eyes! I never knew there were so many different kinds of wild cats before. 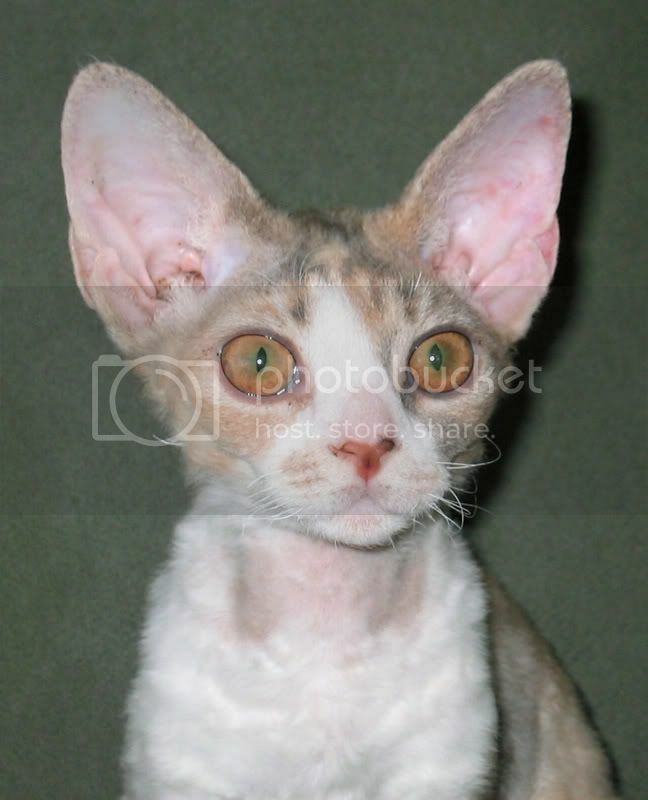 I will say also, it is amazing how many cat species there are out in the world. The leopard cat is beautiful. Looks like he has long legs, at least the picture portrays that. There is an article in the July Readers Digest about another Wild Animal Sanctuary in Keenesburg Colorado. Sounds like mostly cats. It Had a picture of two beautiful spotted leopards and a black leopard. Seems like since I have been visiting your blog I have been running across more articles about cats. What a very pretty cat! I like his reddish stripes. Used to be found in the long island of Cebu but is believe to be extinct due to loss of habitat. Now found only in the island of Negroes with estimated wild population of a hundred. Both island are in the central part of the Philippines. wild against regulations and list them as captive-bred.." I recommend that the wording, "hunting for commercial purposes!" in the above description be changed to a more accurate reflection of the extent to the illegal wildlife trade and the probable possibility that the legal trade is tainted. The worst threat to the Leopard Cats is the fur companies in China,they harvest 800,000 Leopard Cats a year,all taken from the wild to make coats.We need to stop this illegal trade! Economicskey Provides quality Economics homework help for students. collegeadmissionessays.XYZ Amazing article thanks or sharing..